'Respect The Robot': Giant Robots Oversee Traffic In Kinshasa : The Two-Way Two giant robots have directed traffic in the capital of the Democratic Republic of Congo since 2013. This week three others joined them. A man walks by with a basket of bread during the official presentation ceremony of three new robots that were installed Tuesday in Kinshasa, Democratic Republic of Congo, to help tackle the city's traffic. 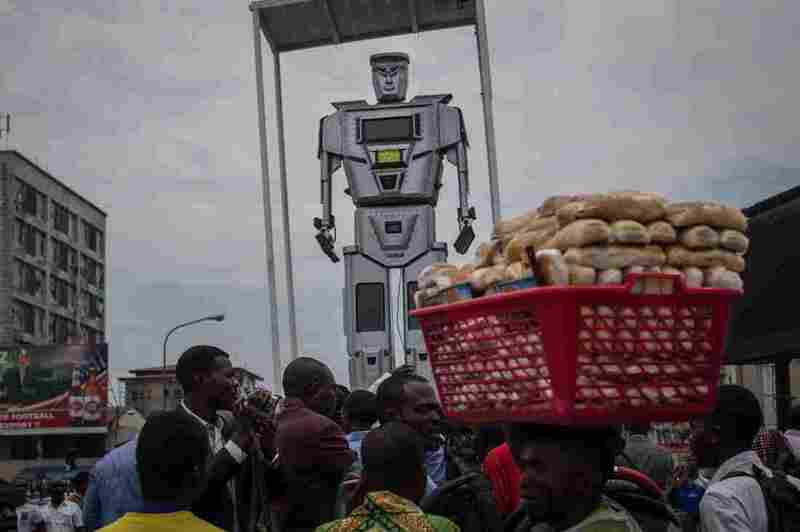 The two giant robots who have directed traffic in Kinshasa, in the Democratic Republic of Congo, since 2013 have company. Agence France-Presse reports three new robots — developed by Women's Technology, an association of female engineers — were positioned this week across the city of 9 million people to direct traffic. The giant robots are solar-powered, have chests that rotate and are equipped with cameras that send real-time information back to the police station, AFP reports. It's unclear why this is any different than having traffic cameras — besides the fact they look much cooler (and more intimidating) — but the robots appear to be having the desired effect. "There are certain drivers who don't respect the traffic police. But with the robot it will be different," taxi driver Poro Zidane told AFP. "We should respect the robot." You can watch a video from AFP on the robots below (in French).